There are many ways to make ourselves fitter, slimmer, more handsome and more stylish. But you don’t have to do all the hard work yourself. Calling in reinforcements can sometimes be the difference between getting mistaken for Ryan Gosling and Ryan Gosling’s weird uncle. Working at the vanguard of men’s style, these seven experts have charitably dedicated their professional lives to making you look a few degrees more dapper. So, whether you’re on a quest to hone your wardrobe or make yourself look younger, here are all the experts you need in your life and saved on your phone. Unless you were blessed with a model’s physique, there’s probably little chance of a suit fitting you perfectly straight off the peg. Having a tailor on speed dial can make all the difference. An experienced man of the cloth will be able to stop trousers pooling around your legs and sleeves sitting sloppily on your knuckles, turning an inexpensive suit into a pricey-looking one in the process. “Having yourself a trusted tailor who will give honest advice on dressing well and the skills to make it happen is key,” says tailoring expert Jolyon Bexon, who has spent his career working for the likes of Gieves & Hawkes and Brioni. Alterations are a man’s tailoring training wheels, before progressing onto made-to-measure and even bespoke suiting – the home of which is on London’s Savile Row. It isn’t only suits that a tailor can turn their hand to, either. Everything from shirts to jeans can be darted, tapered, nipped and tucked to fit, and therefore look, better. When you consider that a haircut is the one thing you’ll wear day in, day out without fail, it becomes clear why getting it right is so important to your overall look. With that in mind, you need a regular barber in your squad of experts, one who knows what works for your face shape and hair type, as well as being able to give advice, taking into account things like your lifestyle and job. Don’t be afraid to splash out on this one. While it may be tempting to cut corners, a quality barber will be well worth the investment. A trip to the barber shop should never be a chore, so as well as finding a person you don’t mind visiting every four-to-six weeks, you should find a shop that suits your taste, including the right location, design and atmosphere. Although you should be used to cleaning and polishing your shoes on a regular basis, an experienced cobbler, the third position in your seven-person style team, will be able to add years to the life of your footwear. Having trained in topics such as basic foot anatomy, shoemaking techniques and lasting methods, a cobbler will be able to re-heel worn shoes and add padding to uncomfortable styles. There is a limit to what they can do, however, depending on the construction of the shoe. For example, Blake-stitched shoes generally wear out quicker, and the sole is harder to repair. 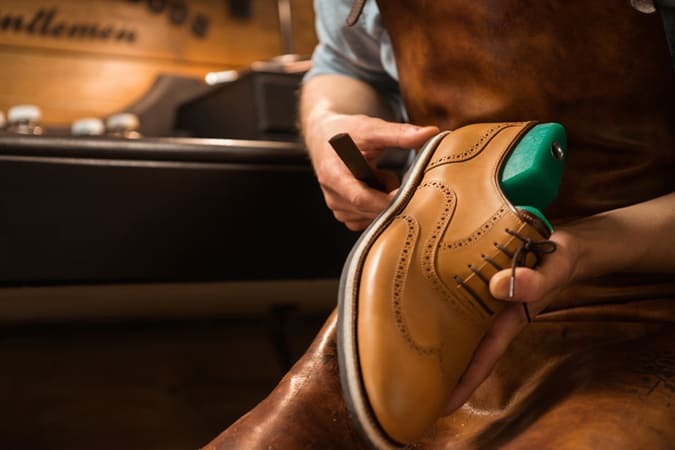 Fortunately for fans of traditional British shoes, most are made using a Goodyear-welt, making them easier to repair and replace, providing you find a cobbler familiar working with traditional processes and manufacturing methods. Staying abreast of the latest fashion trends is like keeping track of the stock market, but working out how they translate into your own wardrobe can be even harder. That’s why outsourcing the task to a menswear expert can make life a whole lot easier. A stylist will not only pick out garments that suit your body shape and lifestyle, but also – most importantly – your individual style. Even the most discerning men will find a second opinion helpful when posed with a sartorial dilemma. If a one-to-one consultation is out of your budget, there are plenty of online styling services which offer cost- and time-efficient alternatives. Digital stylists collate information on your taste, measurements, favourite brands and lifestyle before compiling a bespoke trunk of hand-picked pieces that are sent out for you to try on at home. Not only do you only pay for the items you keep, each time you order the company continues to build a personal profile and refine its selections, learning the cuts, colours, sizes and brands that suit you best. Skin is a funny thing. It’s the largest organ in the body, yet the amount of time dedicated to it often pales in comparison to the hours most men spend fawning over their biceps or follicles. If you’re still using the same all-in-one face wash, shower gel, shampoo and conditioner from your teenage years and wondering why your skin is red, white and flaky, you’re doing grooming wrong. Seek the counsel of a dermatologist to come up with a tailored skincare regime that’s right for you. “If you think you have a condition [such as eczema], have been diagnosed by a GP or are unhappy with the appearance of your skin, it’s best to see a consultant dermatologist,” says Dr Adam Friedmann from The Harley Street Dermatology Clinic. Experts in the epidermis, a dermatologist will easily be able to suss out what skin type you have and ultimately what products will make the best of what your mamma (or a hard, partying lifestyle) gave you. There is a distinction to be made between consultant and cosmetic dermatologists, though. The former specialises in persistent medical skin problems, whereas the latter focuses on scrubbing up already decent skin. 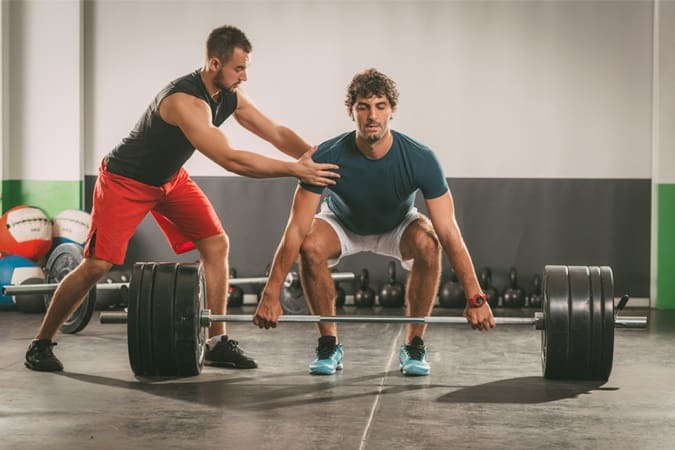 Whether you’ve been sculpting your physique for years or are an obvious gym newb, enlisting the help of a personal trainer can offer the expertise and the motivation you need to reach your fitness goals. With knowledge (usually) rooted in science, a trainer can take an in-depth look at your eating habits and offer advice where you might make positive changes, as well as create more effective workouts. They can also determine whether the goals you’ve set are realistic and ensure you stay motivated. You’ll be spending a lot of time with this expert, so it’s important to choose someone who you have a good rapport with. Look for a trainer that has a proven track record, and the necessary qualifications to match. While we can’t guarantee you’ll enjoy regularly being put through your paces, you won’t regret the investment when you start to see the results. The adage goes that you are what you eat. But while undertaking Operation Swole, it’s easy to forget that bulk eating chicken breasts and guzzling protein powder does not constitute a balanced diet. Nor is the path to healthy hair and zit-free skin paved with sugar, junk food and caffeine. Unsurprisingly, there’s no silver bullet which is going to turn everyone from dull to dazzling because all bodies are different. Which is why it pays to take advice from a professional. Crucially, nutritionists take at least some of the bother out of the relentless and complicated task of eating well. By constructing organised, science-backed meal plans, they’re removing your will to pick and choose, which means that you get dietary discipline and positive results.